Why do Japanese octopus wear headbands? I’ve been wondering about this for a long time: why are たこ always represented wearing 鉢巻? I mean, I understand the mouth, but where does the headband come from? 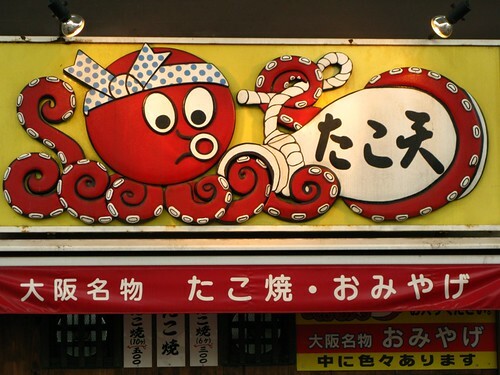 Is it because hachimaki is a symbol of hard workers and the tako with its 8 “arms” must be good at multi-tasking? Posted on November 18, 2008 Categories japan, RandomTags japan, octopus, tako4 Comments on Why do Japanese octopus wear headbands? Colleague: We have a problem with the *censored* server. Boss: Where is that server located? Colleague: It’s in the Intellectual Property room, on the 2nd floor of the Reliability building. Me: Yeah, you know that place? It’s right next to the office of Lost Causes. We always have lots of fun during our daily meetings. Last Saturday in the early afternoon, we had a huge dust storm all over the 関東 area. It started out as a very nice day, sunny 15°C, I went for grocery shopping in just a light sweater. Then around 2PM, the sky suddenly became dark, great gusts of wind started whistling around the corners of our building, we could see the road signs and city lights shaking in the street and parked bicycles being blown away. The sky became dark yellowish / light brown as the huge dust cloud passed over us. Then it was over in 15 minutes. I couldn’t take a good photo as my girlfriend wouldn’t let me open the windows or open the door to go outside (we just cleaned up the apartment, so letting all this dust come in was definitely not a good idea), so I got this photo of the event from surround’s photostream on Flickr. 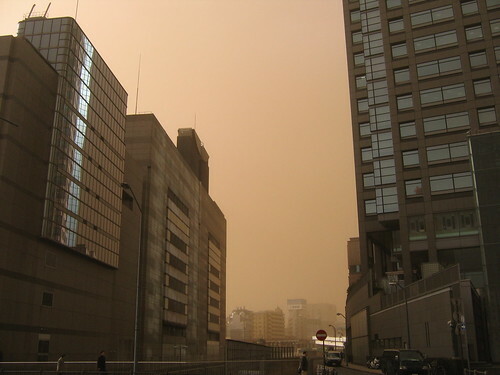 Apparently, these dust storms happen often in the Kanto plain at the turn of spring. This huge plain all around Tokyo is heavily farmed and parched fields, from the very dry winters we have here, go up in dust with the strong winds marking the coming of spring. My job consists of writing functional specifications and generally managing the architecture of a big R&D information system based on a wonderful jack-of-all-trade application called eMatrix from Dassault. I often delve deep into the application with the MQL console (for Matrix Query Language) to dig out some insight into the data we manage. If someone has any insight on how a query language can be this flawed, I’m all ears. In Japan, the new year is a big thing. Unlike in western countries, it’s a family holiday when all come, eat traditional food (new year soba) and go to the temple for a blessing and good luck in the coming year. It’s also a rare time when all all shops, banks, etc. can close for a few days straight. Do not get caught without cash on new year. Most banks will close all operations between January 1st and 4th, and that means everything, even ATMs. It’s advised to pack your pockets with cash, at least 100.000¥ for the duration of the black-out. Countless foreigners have been found sleeping under the bridge after not taking heed of this warning. Bring together the Japanese love of over-packaging, presents for the kids, family reunions… all in a 15 storeys building (that’s 60 apartments), and you get a wall of detritus filling up from floor to ceiling the trash room. This photo was taken on January 2nd, I can’t wait to see what happens by the end of the week. If you’re in Japan and you want a free (or almost free) WiFi router, here’s your chance. One year after its introduction in Japan, the FON network gives away their Fonera routers for free this weekend only: Saturday 8th and Sunday 9th December. These cool little boxes let you share your connection safely with the public, and if you do you’ll be granted free internet access through all the other boxes in the network: 208.000 access points around the world, 25.000 in Japan only. I got one for free 1 year ago when they did the same campaign for the launch, it’s a nice initiative.